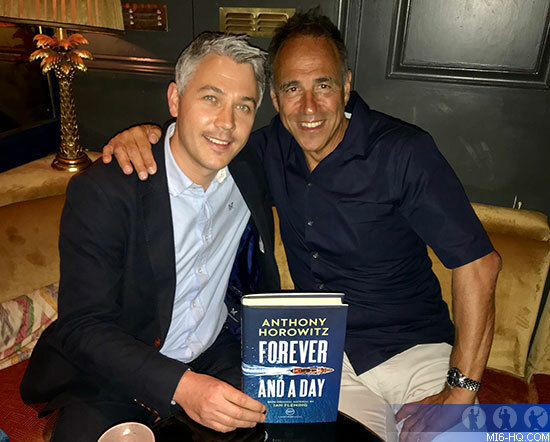 Ian Fleming Publications and Jonathan Cape celebrated the publication of their latest James Bond continuation novel, Forever And A Day, with a launch party at The Scotch of St James in London. Tucked away in the heart of Mayfair, this historic venue was once “the” rendezvous for London’s rock elite in the 1960s. Anthony Horowitz said in splendidly witty 007 themed speech, “I have grown up with Bond. Ian Fleming was the great love all my life. Tonight I even feel a bit like James Bond and I’m sure the fans in the room might have noticed I’m wearing a Sea Island cotton shirt – a birthday present from my son Nick!” Horowitz thanked his publishers on a great marketing campaign and drew particular attention to the dust jacket designed by Kris Potter. He thanked IFP and teased; “You are sort of my SPECTRE and in this case it stands for Supportive, Professional, Enthusiastic, and Checking The Royalties Everyday!” Horowitz concluded by acknowledged the hard work of the booksellers. In a shrinking high street market, bookshops up and down the country have gone to great and innovative efforts to promote the title. Representatives from both the Ian Fleming family and EON Productions were in attendance as well as other notable guests from the world of James Bond including Young Bond author Charlie Higson and Fleming biographer Andrew Lycett.